Meng Han was arrested on 3 December 2015, when Chinese police carried out a series of surprise raids on the homes and offices of around 50 staff members and volunteers working for labour rights groups in Guangdong, China. 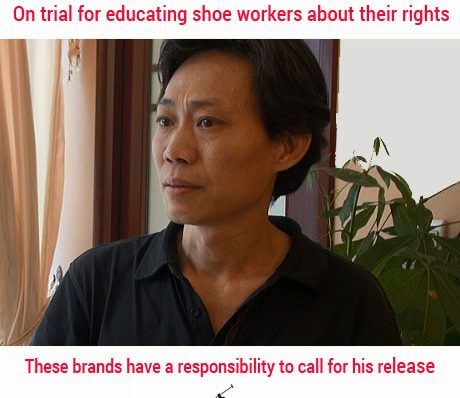 The arrests of Meng Han and other labour activists were part of a general raid by Chinese officials on NGOs supporting labour struggles in China, but are widely thought to have been linked to a specific labour dispute at the Lide Shoe Factory in Panyu district. A series of strikes at the factory in 2015, involving more than 2500 workers, led to a successful negotiation with management over social insurance, housing contributions, overtime and annual leave payments. Meng Han has been in detention since December 2015, and only allowed sporadic contact with a lawyer, a violation of Chinese law. Three other labour activists arrested at the same time were tried at the end of September 2016, when they were handed down suspended sentences of between one and three years. At that point, the hearing for Meng Han’s case was suspended for further investigation. Meng Han has been intimidated during his detention, with the authorities putting him under pressure to incriminate one of his fellow activists in return for a lighter sentence. Meng’s family faced continual pressure during his detention, to the point that his parents had to move out after unidentified thugs attacked their apartment door with an axe. 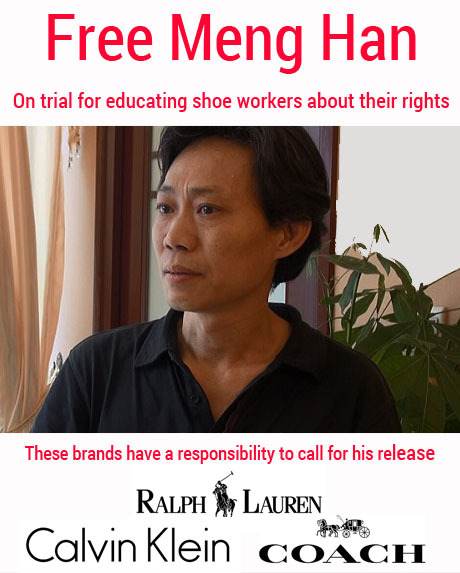 Because they were sourcing shoes from the factory, Calvin Klein, Coach and Ralph Lauren have been asked by workers’ rights groups to make statements to the Chinese authorities to call for Meng Han’s release. In the run up to Meng Han’s trial on Thursday 3rd November, these brands will be targeted by campaigners and consumers through social media. Labour organisations in Hong Kong are calling on Chinese authorities to respect workers’ rights to freedom of association and collective bargaining, to drop all political persecution of Chinese labour organisations, to release all arrested activists and curb the abuse of power by local authorities.